The Pediatric Primary Care Center (PPCC) offers primary pediatric care for children from birth through adolescence, whether your child is sick, needs shots or just a check-up. The center is located on the second floor of the medical office building at 3430 Burnet Ave. at the Cincinnati Children’s Burnet Campus. We're on the Metro bus line and offer on-site parking. Provide great medical care for your child. Help keep your child up to date on immunizations (shots / vaccines). Help support children with chronic illnesses like asthma and ADHD. Keep on schedule, and let you know about any delays that may occur. Coordinate care across the healthcare system. Give you tools and resources for self-management. Assist with behavioral healthcare needs through co-located psychiatric providers or with community behavior healthcare partners. Get regular check-ups for your child. Bring any medications your child is taking to your appointment. Be on time for our appointments. Cancel appointments ahead of time. Let other providers that you see know that we are your primary care providers. Let us know when you have seen other providers outside of our office so we can coordinate your care. Why Do I Need to Choose a Doctor? It allows you and your family to develop a bond with a doctor. The doctor can get to know your child and your family. Talk with family and friends about doctors they recommend. Think about what you liked about the doctors you have seen in the past. Choose a doctor you feel has those qualities. Ask yourself: Is it easy to talk to this doctor? Will I Always Get to See the Doctor I Choose? Every effort is made to schedule with your child’s regular doctor at your request. Resident teaching clinic – The PPCC is a teaching clinic. Your child may be seen by qualified doctors in training who are supervised by attending physicians. After your child is 2, schedule yearly check-ups. You will receive a reminder phone call for scheduled appointments. Social workers − Help patients and their families deal with concerns about an illness or disorder and help families find resources to support optimal health. Learn more. Nutritionists − Make sure all patients are getting proper nutrition. Learn more. Child Life specialists − Work with children to promote normal growth and development and support patients and their families during challenging procedures in clinic. Learn more. Legal Aid − Helps promote children’s health and well-being by resolving legal problems. Learn more about our Child Health-Law Partnership Program. Call us with your questions or concerns. Nurses are on call 24 hours a day to answer questions. The nurse can get you an appointment in the PPC Clinic or send you to Urgent Care or the Emergency Room, if needed. We accept all public and private insurances, as well as work with families without insurance. For information on potential sources of insurance, visit HealthCare.gov. To transfer records to or from our office, call the office or contact Health Information Management at 513-636-4217. With input from families and community partners, Cincinnati Children’s has created an innovative new waiting room in the Pediatric Primary Care Center (PPCC) to more effectively link families to community resources they need to thrive. Many families seen in our primary care clinics are affected by social, economic and environmental risks that can have enormous impact on their child’s health and well-being. We wanted to develop a way to help families seamlessly connect with the best community resources to meet their needs. Connect families with leading community interventions to improve child health and help families reach their full potential. Ensure families feel valued by addressing their most pressing needs in a safe, welcoming environment. Offer fun, educational activities to positively distract kids, so parents can focus on getting support. With pilot funding from the Center for Clinical and Translational Science and Training (CCTST), students at the Live Well Collaborative helped us strategize what a more welcoming, productive waiting room for families might look like. GBBN Architects, Kolar, Messer and RCF Group designed and constructed the new space. Major League Baseball and the Cincinnati Reds awarded Cincinnati Children’s a 2015 All-Star Game Legacy Grant to bolster donor and hospital support for the project. To learn more, contact Adrienne Henize at adrienne.henize@cchmc.org or 513-636-0405. Option 1: Schedule, reschedule, cancel a check-up or follow-up. Note: We have limited availability for new patients. 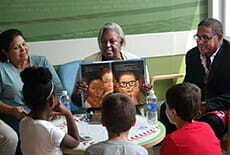 Sharon Robinson, Jackie Robinson's daughter, reads to children in the new PPCC waiting room.